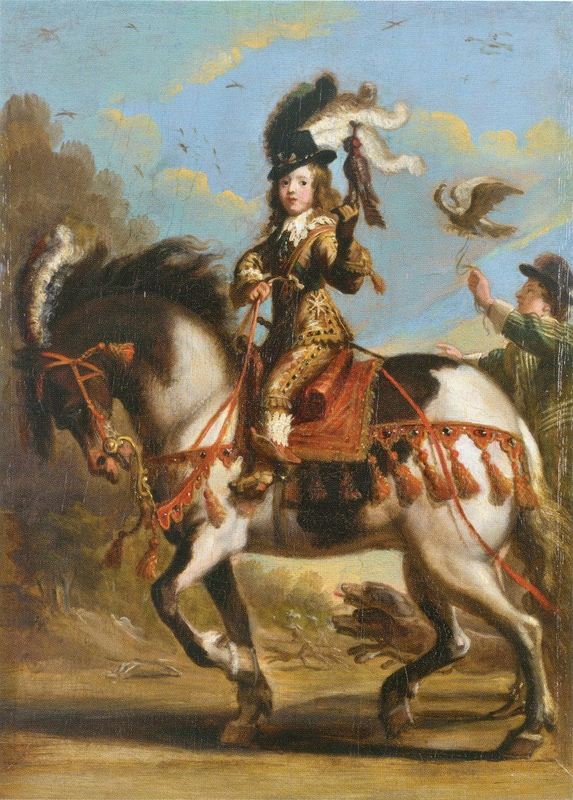 Louis, who in 1643 had become King of France, is portrayed as a hunter with his falcon sitting on his left hand. At that time he was 5 or 6 years old but he was already represented as a professional falcon hunter. That image belonged to his royal status. He rides a piebald (or skewbald) horse that seems perfectly trained for the young Louis to concentrate on his hunting sport. Even with a long rein on the curb bit the horse keeps its neck arched. The harness and trappings are heavily decorated. The red breast-band and crupper are provided with tassels and stones. The same tassels have been fixed to the bridle. Even the richly processed reins are decorated with tassels and loops. The saddle and saddle cloth are in the same style. The high plume on the horse’s head corresponds with the plume on Louis’s hat. The striking colors of the horse go well with the colors of the harness and the dress of the rider. We may think that decorating the horse’s harness is an exclusive royal luxury, but this human tendency has always existed in all layers of the population as far as the means would allow. In our present time we see children and adults who decorate their horses with pink brow-bands provided with stones combined with pink bandages and hold a pink whip.